Halve peaches and remove the pits. Scrape the seeds out of the vanilla bean. Add wine, scraped vanilla bean and vanilla seeds, lemon peel, and sugar to a large pot over medium heat. Stir until sugar is dissolved, add the peaches, and let simmer approx. 5 minutes, so that the peaches remain firm but are fragrant. Remove the peaches from the pot, cook the syrup further for approx. 3 min. or until reduced, and remove from heat. In a frying pan, toast sliced almonds over medium heat until golden. Blend part of the raspberries with confectioner’s sugar and lemon juice. 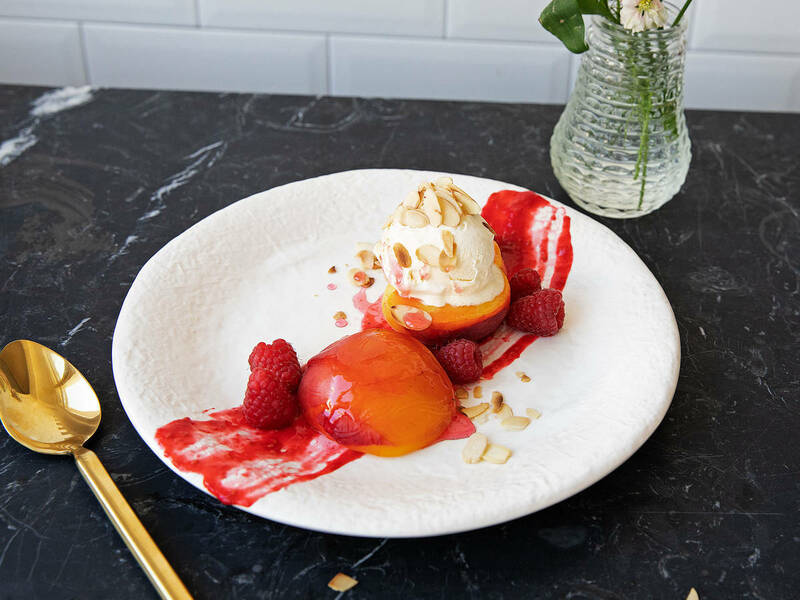 To serve, place 2 peach halves on each serving plate, drizzle with syrup, raspberry sauce, almonds, fresh raspberries, and a scoop of vanilla ice cream. Enjoy!